Subject: Implementation of the Government decision on the recommendation of the Cabinet Secretary’s Committee- Revision of pension in respect of Personnel below Officer Rank (PBOR) discharged prior to 01.01.2006. The undersigned is directed to refer to this Ministry’s letter No. 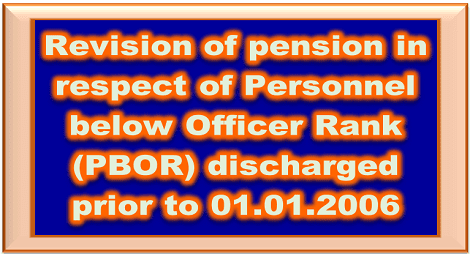 PC 10(1)/2009-D(Pen/Pol) dated 8th March, 2010 under which service pension of Personnel below Officer Rank (PBOR) discharged prior to 1.1.2006 were revised w.e.f. 1.7.2009 to bridge the gap between Pre-2006 and Post 2006 discharged PBORs. 2. It has been brought to the notice of the Ministry that revision of pension in respect of three trades of Air Force viz. ACH GD, Catering Assistant and MT Driver is being carried out in Group Z instead of Group Y inspite of up gradation of these trades w. e. f. 10.10.1997. 3. The anomaly raised by Air HQ has been examined by the Ministry and it is decided that revision of under mentioned trades be carried out as per pension revision tables meant for Group Y under this Ministry’s letter No. PC:10(1)/2009-D(Pen/Pol) dated 8th March, 2010. 4. PDAs may not be able to carry out the revision as stated above as trades of the defence personnel are not captured on PPOs. As such, revision cases under this letter would be referred by the PDAs to the concerned PSA through Air Force Record Office. The Record Office would confirm the trade of the individual at the time of discharge to enable PSAs to issue the Corr. PPO in these cases. 7. This issue with the concurrence of the Finance Division of this Ministryvide their UO No.10(06)/2017/FIN/PEN dated 12.01.2018.